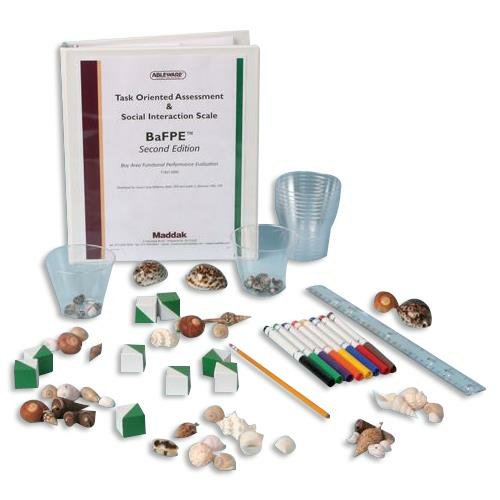 Maddak Bay Area Functional Performance Evaluation (BaFPE) Kit is a two-part - Task Oriented Assessment (TOA) and Social Interaction Scale (SIS), behavorially-anchored assessment designed to assess how a client may function in task-oriented and social interactional settings. The BaFPE has been used in inpatient and outpatient settings to evaluate the functional performance of psychiatric, brain injured, geriatric or developmentally disabled adults as well as adolescents. Utilizes five tasks in which twelve functional parameters in cognitive, performance, and affective areas are rated. Observations about specific cognitive and neuropsychological functioning are made during each task.